Tax season is commonly regarded as a period of dread and anxiety for Americans, and many people admittedly say that filing their taxes brings on a great deal of stress. However, a large percentage of individuals say they experience the opposite and actually look forward to fulfilling their obligations as a taxpayer, according to a new study. Findings from the Pew Research Center reveal that nearly a third of study respondents - 29 percent - enjoy the process of gathering financial records, meeting with their tax preparer and submitting their returns. Another 5 percent said they actually love doing their taxes. The reasons participants cited for positive feelings about their taxes varied. Approximately 29 percent said they enjoyed getting a refund and 17 percent said they either don't mind completing their forms or are simply good at it. Thirteen percent said filing their taxes gave them a sense of control, while an equal number said it allowed them to fulfill their obligation as a citizen. Similarly, however, 30 percent expressed dislike for tax season and 26 percent said they downright hate filing their returns. Confusing paperwork and complexities were cited by 31 percent of survey respondents as the primary reason they don't like filing their returns. Another 24 percent said filing is too time consuming, while 12 percent said they disagree with how the government uses tax funding. While some individuals may never particularly like filing their taxes, there are several ways to reduce anxiety and make the process simpler. 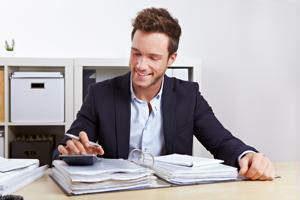 Half the battle is getting paperwork and documents organized, according to Bankrate.com. Therefore, individuals should start as early as possible, which will ensure they have ample time to review their W-2 and 1099 information, make sure all pertinent documents were received, gather receipts, invoices and other necessary documentation and make a list of questions about their returns. Individuals should also book an appointment with their tax preparer earlier rather than later. Working with a tax professional can eliminate the stress of trying to file complicated or complex returns, help consumers secure the deductions and credits of which they may have been unaware and give workers the opportunity to ask questions. Filing early may also give those who owe a tax liability the time they need to make payment arrangements or enroll in an installment payment program with the IRS.